While still officially in the middle of my “stay-cation” I awoke to a strong, pre-frontal S. wind this morning and, though I hadn’t really planned to fish, couldn’t pass up these conditions this time of year. 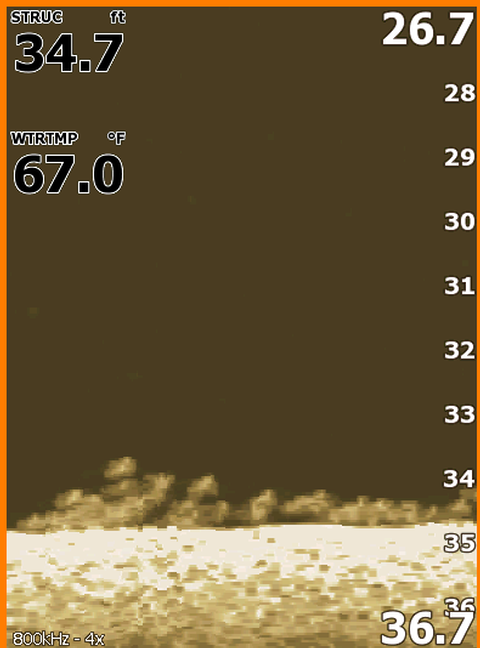 Lowrance downlooking StructureScan on 4x zoom shows these white bass holding in a tight school right near bottom on the windward side of Area 145. 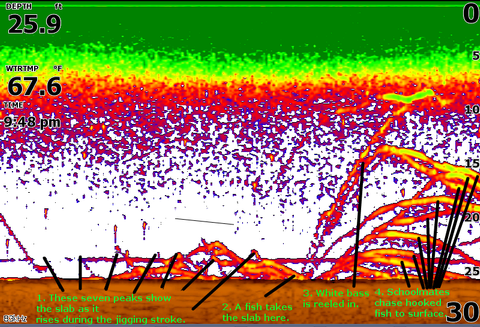 A traditional sonar shot showing 7 jigging strokes near bottom, followed by a fish taking my slab, being reeled to the surface, and being pursued by approximately 13 other schoolmates near Area 175. I kissed Rebecca goodbye, agreed to meet her back at the house by 10am for home-made waffles, and headed out to Stillhouse. Long story short, I did a quick troll by Area 116 and boated a nice, 2.25 pound largemouth on a crankbait, but was actually checking for shallow whites, so, finding none, I moved on. I hit two areas and both were loaded down with fish. First I hit Area 145 and fished the side being impacted by the wind. As often happens this time of year, there was barely of trace of life to be seen on sonar, but, I must say, the confirmation now offered by the downlooking feature on the StructureScan does make that chore easier (albeit still not easy — you really have to look and have all the setting tweaked just right). Anyway, I dropped a slab, jigged it twice and had a fish on. This fish came on so aggressively and there we so many other fish that just materialized after the first on was hooked, that I switched over to the 3/4 oz. slab from the smaller 3/8 oz. I had on, knowing the faster the slab sank, the quicker I’d get another hookup. Well, this continued and I ripped through 38 fish before the frenzy weakened. It was at that time that I put the trolling motor in hover, went back to the console and played around with my electronics in order to capture the images below. After things went quiet here, I moved on to between Area 067 and 175. Pretty much the same thing happened here … there wasn’t much to see on sonar, but, once I got a slab down there, the fish came up off their “belly to the bottom” posture and began thumping the slab everytime it got in front of them. I boated 29 nice white bass here by about 9:20, and knew I’d better not be late for brunch, so, with a drizzle beginning to fall, I left the fish biting, cranked her up and headed to the dock. Wind: Winds were strong from the S. at 16 bringing pre-frontal conditions in advance of a coldfront that arrived right around 5:30pm. Skies: Skies were turbulent with 100% grey cloud cover.